Yes, actually I do. There is something much more compelling about the use of iconic imagery that is readily obvious when you train your eye on visual examples. Now, let's go back to Roger's example, to see if he is on target. My own gut calls it a slam-dunk and I would hazard a guess that many of you do too. So why isn't this technique used more in rpg maps? I mean seriously, take even my five top-picked maps. I won't budge from calling them great maps, but they do pass up some opportunities from real-life map-making to make them even greater. 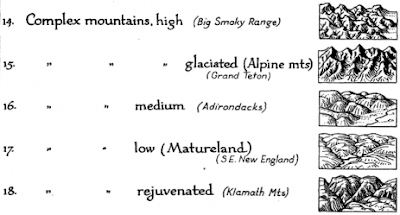 Note how much mileage he gets out of granular distinctions. Now imagine that on a map near you. Yessssss very awesome. Those last ones would make for a cool map. Thanks for the riff ... Here's another observation: The garish country colors in the Divine Right and Dragon Pass game maps are symbolic, the naturalistic terrain colors in the Greyhawk map are iconic, which is why the Greyhawk one comes off better at a distance. 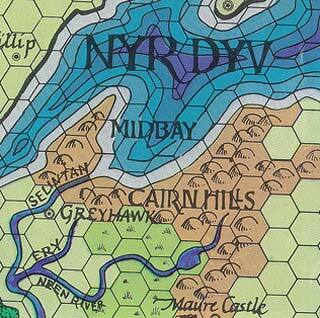 Original Greyhawk also had the virtue of leaving a lot to fill in, with its tracts of same-y terrain. A more complete or detailed map doesn't leave as much latitude, and most GMs worth their salt want to have at least some creative control. 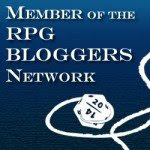 This is something that a lot of fantasy setting products forget. 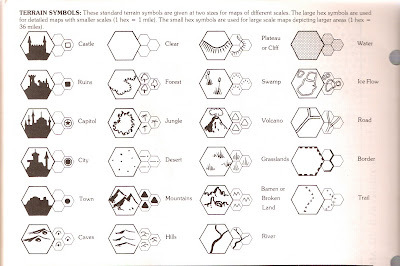 I remember that my reaction to the Expert D&D book terrain symbols was exactly the same as yours ~30 years ago (I loved the 'iconic' ones). Another great post! I think that I'll try to use more 'iconic' symbols in my future maps. You're right. I've always thought those sort of map symbols should be used more. I am definitely of the camp that thinks that howling emptiness is an asset. 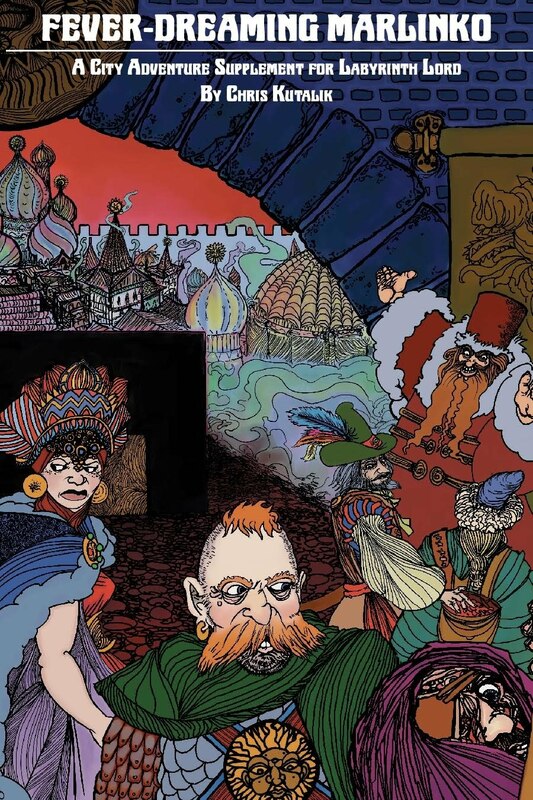 Greyhawk, almost by necessity, launched a thousand homebrewed campaigns. Yikes, has it really been 30 years. Suddenly feeling old. Of course the obvious drawback (praxis always more difficult than theory) to this awesoming up is that it entails being able to actually draw these nice bits. 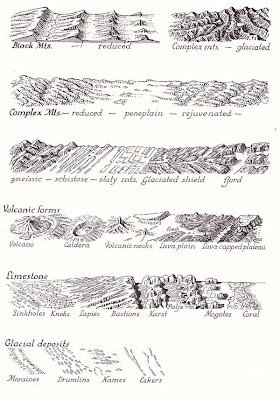 I spent an ungodly amount of time yesterday trying to draw karst topography that didn't look like an inkblot psychology test. Excellent insight! Definitely lots of food for thought here, as I mostly agree, with a few, striking exceptions. Kinda. Gotta see if I can round up the examples I want for my own post on this topic. > The garish country colors in the Divine Right and Dragon Pass game maps are symbolic, the naturalistic terrain colors in the Greyhawk map are iconic, which is why the Greyhawk one comes off better at a distance. 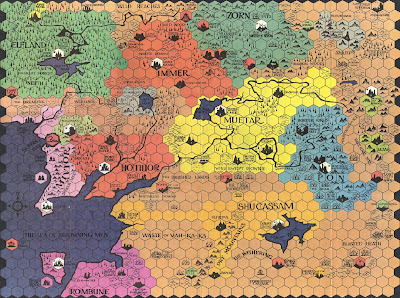 To be honest, I prefer the original Dragon Pass from WB&RM (1975) http://tinyurl.com/6jadjrm ; even though I'm no fan of forcing a limit on forcing design limitations which may be of use in a hex-based game but impede the finer resolution which I'm looking for in my own campaign games; for example, a large town with satellite settlements and a wizard's tower all of which would lie within the same hex - were I using a hex-based mapping schema. (Personally, if adding hexes at all I prefer a transparent hex-lined overlay). > My own gut calls it a slam-dunk and I would hazard a guess that many of you do too. So why isn't this technique used more in rpg maps? 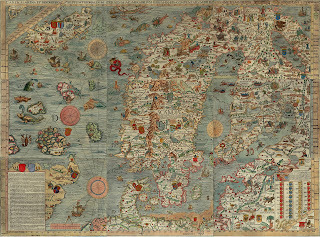 Presuming that, and for hex-based mapping given the examples cited... looking back to the history of "rpg maps", functionality to a degree, perhaps? 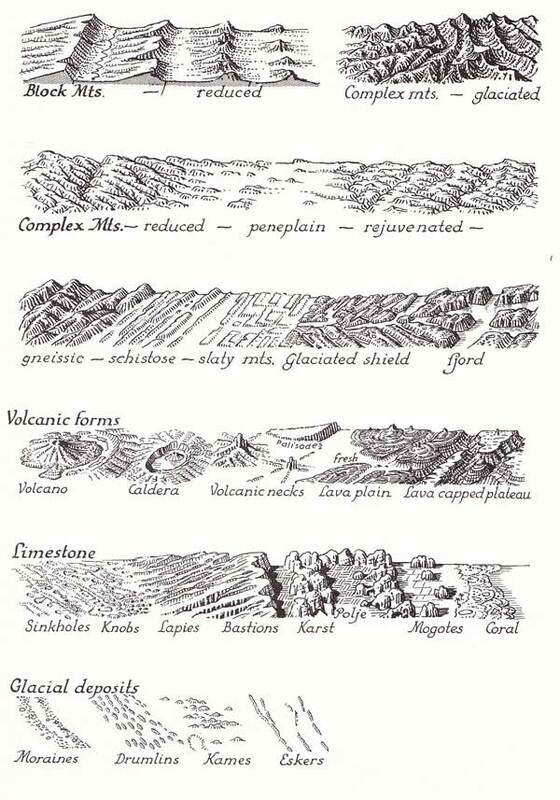 If you're in hexcrawl mentality (which OD&D is since movement points resolve to hexes, not miles) then all you require to know is the terrain type. One can see the JG maps per-AD&D /trying/ to break hex boundaries but doing so creates problems in game ruling since it's no longer clear how to apply those movement rules in a mixed hex. 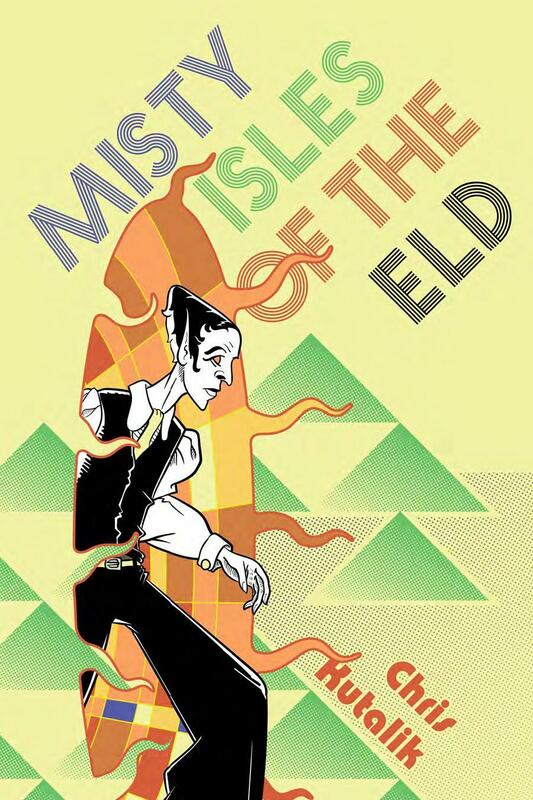 So, while the mechanics vs. realism battle was pulling in the latter direction (AD&D uses miles, of course) that pull breaks down the perceived need for iconic representation of certain features (town/cities, in this case) since they are not keyed in to hex scale. 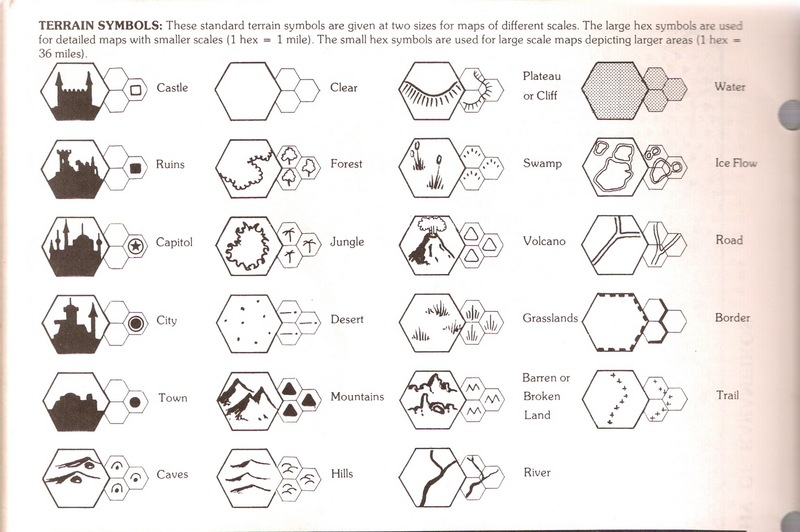 Hence, pretty hex-filling icons (and not just for cities and towns) are all very well on what might be labeled a "wargaming map" but can get in the way of game play considerations on a "roleplaying map". 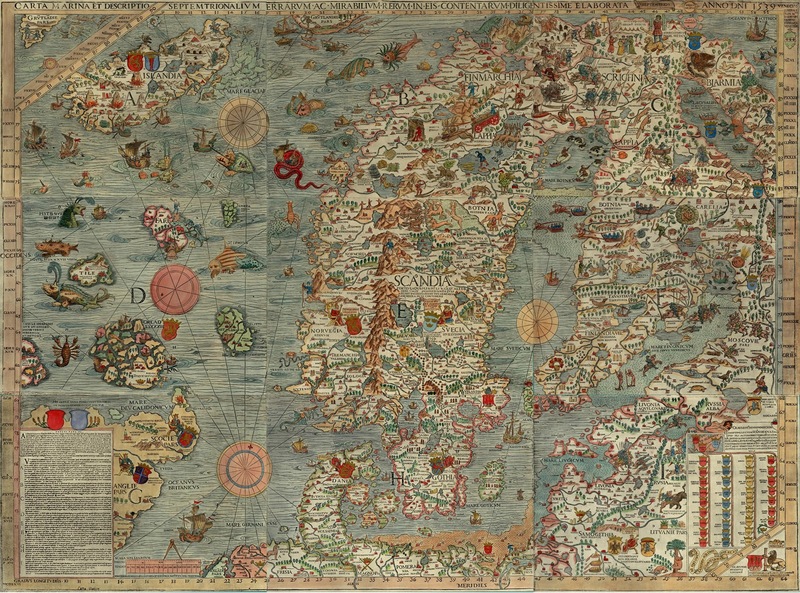 All of your posts and observations about maps and choice of pictures in your blog are truly awesome! There is only one way and that is diversity of presentation is the rule. Although hex maps really are only for large scale war gaming.